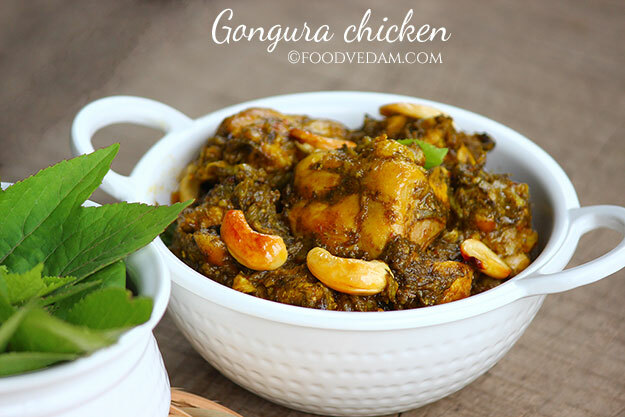 Gongura chicken is one of the popular recipes among all Andhra chicken recipes.తెలుగు వెర్షన్. chicken is often cooked with vegetables like cucumber, drumsticks, potato, tomato, Indian broad beans etc….in Andhra. spices and masalas are added in very fewer quantities when cooked with vegetables.this is a healthy way of cooking chicken.so the elder people and children could digest easily. Andhra people often cook chicken with leaves like tender tamarind leaves, kenaf leaves/gongura/ambadi, garden sorrel, pudina/mint and curry leaves. but gongura chicken is the most popular among them. 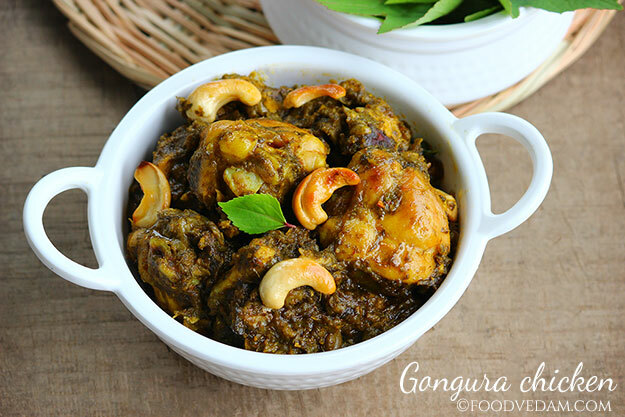 last week when I was buying curries at a curry point(take away), I saw gongura mutton and asked them for taste.it was amazing and the taste was little different when compared with my recipe. I asked them about the ingredients. the difference is that they cook and grind the kenaf leaves before adding.they also add cashew nut paste.so I have prepared according to their suggestions and turned out really amazing. 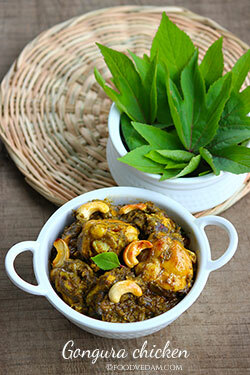 for this recipe, you need to choose red gongura or kenaf leaves. you need to dry them in the shade until the moisture(water) on the leaves completely disappears.otherwise the kenaf leaves become gummy(while sautéing) and smells raw. ఈ recipe తెలుగు వెర్షన్ కోసం ఇక్కడ క్లిక్ చేయండి. heat 2 tsp of oil in a pan, add cashew nuts and roast until golden color. heat 3 tsp of oil in a pan, add green chilies, small onion cut into pieces and gongura/kenaf/ambadi leaves. saute on low heat until the leaves shrink. let them cool down to room temperature. grind it into a paste adding 1/4 of roasted cashew nuts and keep aside. heat 5 to 6 tbsp of oil in the same pan. add finely chopped onions, green chilies and saute until soft. add 2 tsp of ginger garlic paste, curry leaves, and fry until the raw flavor disappears. then add the chicken and mix well.cover and cook on medium heat for 5-7 minutes. open the lid, mix the chicken for once, add salt, turmeric powder, red chili powder, coriander powder and mix again. cover and cook until the chicken is 95% done.mix in between. later open the lid, add gongura paste, garam masala and mix well. cover and cook for 5 minutes on simmer. add cashew nuts and turn off the heat.